A candle centerpiece adds holiday cheer and elegance. A Christmas centerpiece with candles can be elegant or whimsical. There are many designs to choose from that are excellent holiday decorations no matter what type of centerpiece, candles, or accents are used. Candles are a favorite Christmas decoration for many reasons. Their light is welcome during the winter season when the days are at their shortest, and the warmth of a candle can help dispel the chill of winter. Candles represent hope, joy, and renewal, all of which are a part of the Christmas season. 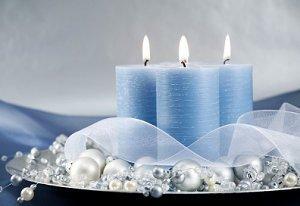 A candle centerpiece is the perfect way to complement holiday décor with the beauty of candles. There are many types of designs for Christmas candle centerpieces, depending on the candles used, the style of the centerpiece arrangement, and decorative accents. Shape: Pillar and taper candles are the most popular for Christmas, but ball candles that can resemble ornaments are also suitable. Tea light and votive candles can be used in smaller centerpieces. Whimsical centerpieces may use molded or sculpted pillar candles shaped like snowflakes, snowmen, holly leaves, Santa Claus, reindeer, or other festive symbols. Scent: A scented candle centerpiece can turn an ordinary decoration into a stunning holiday accent. Gingerbread, vanilla, peppermint, cinnamon, cider, and pine scents are particularly popular for the holidays. Color: Red and green are the obvious choices for candle colors for the holidays, but richer emerald and burgundy jewel tones can be elegant alternatives. Gold, silver, white, ivory, and ice blue are also popular candle colors, while mauve or purple candles are favorites for Advent candle centerpieces. Single Candles: One pillar or taper candle can be a stunning focal point of a centerpiece. Wreaths: Candle rings or wreaths are popular and easy designs for holiday centerpieces. Shields: A glass tube shielding a taper, votive, or pillar candle adds safety and elegance to a Christmas centerpiece with candles. Lines: Several candles arranged in a line along a plate or mirror can be an elegant centerpiece for large spaces. Bunches: Several candles of different heights or colors could be grouped together for a more substantial centerpiece. Elevated: A single beautiful candlestick can be a simple, understated centerpiece. A more elaborate design may include multiple levels. Depending on the size and style of the centerpiece, it can be used to decorate a dining table, entryway table, mantle, or bookshelf. An empty fireplace can also be decorated with a creative centerpiece as a safe alternative to open flames. It is also easy to create your own Christmas candle centerpieces. These three projects are simple and can be made quickly and match any holiday décor. Choose a premade holiday candle ring with plain pine or holly accents. Choose a pillar candle that matches the size of the ring in a color that matches the décor of where the centerpiece will be placed. Add festive accents to the plain ring, such as silk poinsettia blooms, coordinating ribbon, or fake holiday candy. Insert the candle into the decorated ring. Choose a large holiday plate or platter in a bold color. 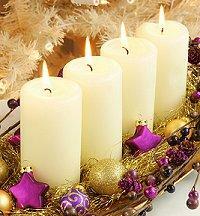 Arrange several medium width pillar candles in different heights in the center of the plate. Sprinkle small ornament bulbs, jingle bells, beads, or faux ice blocks around the candles. Add coordinating ribbons around the candles if desired. Choose a metal or crystal candlestick with a plain design. 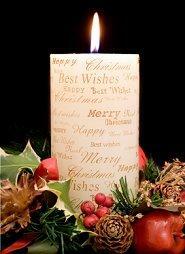 Wrap garland, tinsel, or berries around the candlestick without covering the base or candle platform. Place an appropriately sized pillar or taper candle in the candlestick holder. Place the centerpiece on a star-shaped mirror for extra elegance. Because many Christmas centerpieces include greenery and other potentially flammable accents, it is important to practice appropriate candle safety when using these decorations. Always place candle centerpieces on a protected surface to prevent heat damage. Monitor candles closely so wax does not drip onto the decorations. Do not leave centerpieces burning unattended. Replace candles that have burned down close to the decorative accents. Keep centerpieces away from young children and pets. Consider using electric candles instead of open flames for seasonal decorations. A Christmas centerpiece with candles is an elegant addition to any holiday décor, and it could also be a beautiful holiday candle gift for a loved one or party hostess. As long as the centerpiece is well coordinated and safely used, it will add to seasonal cheer for many years. For more Christmas decorating ideas, visit LoveToKnow Christmas.